In Cameras > Lenses > Show & Tell. In many of my camera posts I mention the greatness of Petzval portrait formula lenses and thought it would be worthwhile for the CW folks to learn about this milestone of optical design. Regardless, this is really cool. The image isn’t mine and I wish I owned the sectioned lens shown here. A close friend, collector and well known camera optics historian commissioned the sectioned lens and took the picture. Unfortunately, he doesn’t recall where the lens went when I recently asked about buying it. Dang! Sometime in 2000, we got into a deep discussion about Petzval optics which resulted in an early, nameless (generic) 1850s lens sacrificing itself for the cause. Don’t fret, it wasn’t a good lens and is now more interesting as a display piece than it was for actual photography. In summary, the Petzval design is made of four 'cells' (lenses); a cemented pair at the front and an air-spaced pair at the rear. The design appears deceptively simple but nothing could be further from the truth. So ... a bit of history and a story. In a nutshell the purpose of a lens is to bend light rays just the right amount so that they all meet exactly at the same point and on the same plane. This goal is better achieved with today’s incredibly complex optical designs. Easily said but it’s really difficult to design optics to get rid of all those nasty bugaboos of distortion, chromatic aberrations (correcting a problem in getting each color of light to focus at the same point) that impact overall sharpness, and so forth. Today’s computer designed lenses are highly corrected and quite good. Although lenses have been around a long time, creating a permanent image (as opposed to looking through a telescope or microscope) uncovers all sorts of problems. Opticians sought image perfection by improving methods of grinding glass into precisely calculated curvatures, combining different lens types, manufacturing different forms of glass material, etc. It was largely a laborious trial-and-error process. 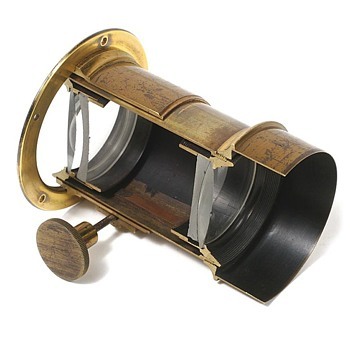 As an aside, the earliest properly designed lens, the 1812 Wollaston Landscape lens, was still being used for inexpensive film cameras well into the 1990s! Furthermore, the basic 1840 Petzval formula was widely used until about 1920. A key problem uncovered soon after the 1839 announcement of the first commercial photographic process was that lenses were extremely ‘slow’. This means that the optics could not gather large amounts of light. The first commercial lens for daguerrian photography was a lowly f/15 aperture equivalent. Additionally, the first daguerreotype photographic plates (polished copper sensitized with a layer of silver) did not have a great deal of light sensitivity. The dilemma was low light gathering lenses plus insensitive plates resulting in excruciatingly long exposure times lasting anywhere from minutes to sometimes hours. This limited the earliest photographs to still objects yet interest in portraits was huge. Hence a problem: Even with the aid of stands, braces and specialized furniture, it simply wasn’t possible for anyone to sit still for these really long exposures. The invention of Petzval’s lens is an interesting story of its own. Recognizing this predicament, the Society for the Encouragement of National Industry offered a prize for the creation of a faster lens. In Vienna, A. F. von Ettingshausen (1796 - 1878 ... a university professor) asked his colleague mathematician Joseph Petzval (1807 - 1891) to try designing a lens. Petzval had no experience with lenses but within six months completed the challenge. The result was an f/3.6 portrait lens with roughly 20x more light gathering power than what was currently available. The first sample was produced in May 1840. A classic Petzval portrait formula lens produces pictures that are sharp in the center and gradually get softer toward the edges. While this doesn’t sound all that great, it was a good thing because the portrait itself was reasonably sharp and tended to hold back the background. In other words, attention was drawn to sitters' faces. Precise focusing was assured by using a focusing knob built into the brass barrel. While there is a small group of photographers dedicated to old processes and early portrait lenses, contemporary digital photographers continue to discover the beauty of images made with lenses based on Petzval formula optics. Slow lens or slow plates ? As a teenager. I worked in an optical shop where we ground & polished glass lens for doctors. Hey BB2 ... at the time, both slow lenses AND plates. The addition of bromide to the silver later on improved plates. How do you slow down the speed of light ? Got my curiosity up. Hey BB2 ... it's about the ability to detect the presence of light and the size (diameter) of the optics to pass light. Think of your eyes ... they only have an ability to detect light above a certain level of intensity (lumens or lux measure). When it gets dark you grab a flashlight to see. Or if you shoot astrophotography with a digital camera, the ISO value is usually bumped up to ISO 1600 - 6400 to capture faint starlight. If you use a cell phone to shoot pictures, you've probably noticed that there is a point in which the camera is unable to 'see' in a darkened room and the flash is triggered. Photographic material is like that; the earliest plates were essentially ‘blind’ to a certain extent. Improvements in chemistry (i.e. adding bromine and other chemicals) amplify silver's ability to efficient detect light. The light gathering power of a lens is based on the diameter of the optics; a mathematical relationship to the focal length that determines the f-stop measure. The lower the f-number, the greater the amount of light passing through a lens. It’s similar in concept to the volume of water that can be passed through a straw or hose in a given amount of time. Binoculars are another good case in point in regards to optics. For example, an 8 x 55mm pair is 'brighter' than binoculars with the same magnification but with smaller optics (i.e. 8 x 35mm). Today’s photographers often invest in ‘fast’ lenses with a maximum aperture of f/1.4 as opposed to f/1.8 - 2.8 to shoot in low light without using a flash. In modern day terms, a maximum aperture of f/15 is a speed that could only be characterized as glacial. You’ve probably noticed that ‘fast’ lenses are much larger than equivalent ‘slow’ lenses. OMG Rob !! this is very interesting piece of camera equipment!! very well made and some history!! Fascinating & informative, love it! Fantastic post. I'm no photographer but this was so well written it made sense, and it was engaging too. I understand now why good lenses can be so very expensive. Design and correct grinding requires knowledge, skill and time! I understand too, but still lost on how I would set things on a fine or older camera. Guess I'm safer sticking with my digital that magically does most of the confusing stuff. Hi Recordmantime; Thanks for the links. The Lomography project is well known. Their lens simulates the Petzval effect but is probably not a true Petzval in design. The company does not disclose the lens specs. Their advertised swirly bokeh, although fun in pictures, was never seen in images made with early Petzval portrait lenses. Bokeh has been a growing fad for digital photographers but has always been a characteristic of large format photography (plate and film formats that are 4" x 5" inches and up). Yet some of the picture samples on the Lomography website are very nice while others overdo the bokeh 'swirl' to the point of being distracting. Anyhow, I've been wanting to try out a Lomography lens. In regards to the eBay listings, some of the lenses are true Petzval designs. Most of the others are later (1866+) rapid rectilinear (symmetrical) formulations. "Petzval" is often an overused term to describe a portrait or early lens of some type (which isn't acceptable). The only way to confirm a Petzval design is to remove the optics and take a look. Regardless, only a few Petzval portrait lenses have any true value but they are fun to shoot with.